Yesterday a friend asked for our itinerary. "We have none," I replied. A brief silence followed. Actually as the departure date nears, we have added a stop to our return, so we know where we will be for the first week (Chania, Crete) and the last five nights. We've included 5 nights in Paris to our return routing, thanks to Mr. Marriott and those loyalty points that lured us in to a timeshare purchase two years ago. (http://www.marriottvacationclub.com/). We will fly from Athens to Paris on EasyJet, the cheapie airline for $73E p/p. (http://www.easyjet.com/). 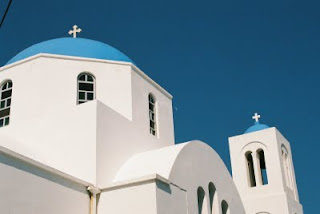 As for yesterday's bombing in two Greek cities (one at the Athens Stock Exchange) . . .we are still heading to Greece, as of this writing. The BBC reports that the bombers called a local newspaper alerting folks to the bomb and allowing police to seal off the area before it detonated. Couldn't help but wonder if they used the news tip line? 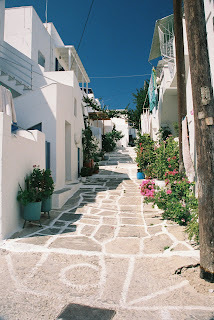 Jackie took the photos on this post in Naousa on the north coast of Paros, an island in the Cyclades. We took the public bus ($2.40E) from where we were staying to this once-fishing-village, turned somewhat touristy-fishing village.